Cold, rather dreary day so I’m making some warm, cuddly, comfort food from my most recent cookbook, The Kitchen of Light by Andreas Viestad. 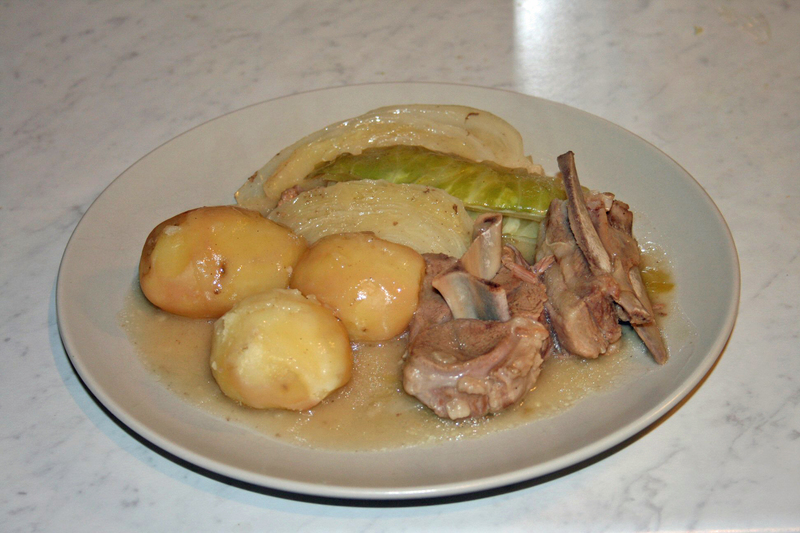 I made the lamb and cabbage stew–well, sort of–I had goat meat in the freezer so I substituted that for lamb. As I’m writing, I’m smelling it cooking–and practically drooling on my keyboard. The stew is in the oven in my “small” Dutch oven (did not make the whole recipe). It smells SO good. I’ve been reading posts from a friend on Facebook singing the praises of this stew–reheats well–which means I can make a batch and freeze some. Really good, fresh-ground black pepper is one of my favorite spices. I’ve gotten hooked on the India Special Extra Bold Tellicherry and that’s what I’m using in this recipe. Regular Tellicherry or Malabar pepper should also work. This recipe is adapted from The Kitchen of Light (Andreas Viestad)–It’s easily adapted for single-serving cooking, but also suitable for making the full recipe and reheating/freezing. 6 pounds of bone-in lamb shoulder, trimmed and cut into 1-1/2-inch pieces. My first adaptation was the use of goat meat since that’s what I had in the freezer–as well as goat brown stock. The goat meat was excellent, but in the future I’ll use bone-in lamb shoulder chops, cut into appropriate-sized chunks. My other adaptation of this recipe was to put it in the oven to cook at 300°F until the meat was very tender. It’s unlikely that I’ll want to make full quantity of this recipe–more likely half, which will still give more than one meal, and some to freeze. This is NOT a pretty dish. By the time the meat is really tender, the cabbage is NOT going to be pretty and bright green. There’s more discussion of this dish on My Little Norway. I like more peppercorns than that recipe uses–I actually added a lot more–and finished my serving with carefully roasted black peppercorns, coarsely crushed. This has me looking for other recipes using cabbage–which I think is an under-appreciated winter vegetable. Too often I think it’s thought of as “slaw”. After reading Viestad’s cookbook and North: The New Nordic Cooking of Iceland by Gunnar Karl Gislason and Jody Eddy, I want to explore more Scandinavian cooking. I found lots more recipes on New Scandinavian Cooking, too–and the manifesto of the “New Nordic Cuisine”. For a beverage with this dish? Well, a porter would be excellent. If I were doing wine, I think I’d look for something really robust–something that has at least some alicante bouchet in it, or maybe a Minervois–I think this calls for some research!